Cross Country Healthcare Inc. on Aug. 6 reported revenue of $126.3 million in the second quarter ended June 30, 2012, essentially flat compared with both the prior year quarter and sequentially from the first quarter of 2012. The company incurred a net loss in the second quarter of 2012 of $14.5 million, which included a noncash goodwill impairment charge of $12.0 million after-tax. Joseph A. Boshart, president and chief executive officer of Cross Country Healthcare, noted that “both the physician staffing and clinical trial services businesses—which combined accounted for 38% of total revenue—achieved year-over-year and sequential growth in the second quarter.” For the second quarter of 2012, the physician staffing business segment generated revenue of $30.9 million, an increase of 1% from the prior year quarter and a 6% increase sequentially from the second quarter of 2012. The year-over-year increase was due to higher revenue per day filled and the sequential increase resulted from higher staffing volume, in particular for hospitalists and emergency medicine physicians, along with higher revenue per day filled. The nurse and allied staffing business segment generated revenue of $67.6 million in the second quarter, reflecting a 1% decrease from the prior year quarter and a 3% decrease sequentially from the first quarter of 2012, both due primarily to lower staffing volume. Segment staffing volume decreased 1% from both the prior year quarter and sequentially. Travel staffing volume increased slightly year-over-year, but decreased 1% sequentially while per diem staffing volume decreased 10% year-over-year and 2% sequentially. Ciber Inc. today reported results for the second quarter of 2012. Revenue topped $237.0 million, a 2% year-over-year decrease, or a 3% increase in constant currency. Operating income rose to $4.7 million, up 117%, or up 11% excluding last year’s significant items. Excluding significant items, revenue decreased 7% year-over-year, or 2% in constant currency. Offering paid sick leave might reduce the rate of nonfatal injury among workers and improve the bottom line at the same time, according to a new study from the Centers for Disease Control and Prevention. Researchers found that from 2005 to 2008 the injury rate per 100 workers among those with paid sick leave was 2.59, compared with 4.18 among those without. Come On Down! You’re the Next Contestant! This ever-popular game show-style session focuses on the ins and outs of employment law. Internal Success: How to Find the Right People to Hire. Among other valuable strategies, presenters examine methodologies in conversational “innerviewing” that result in hiring consistency. The Future of Employment and Leadership for Women. A leading researcher focuses on how gender, generation, and geography are reshaping the workplace. Secrets of Upscaling Your Business. 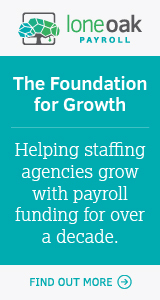 Staffing industry standouts share the successful strategies that reap results and increase profits. Staffing Strategies From a New Friend in South Africa. This unique session takes a cultural look at how staffing professionals make job-related decisions and offers eye-opening strategies. Supplemental Nurses: New Evidence to Achieve Quality of Care. A leading researcher examines objective and scientific evidence focused on the quality of care in hospitals and the use of supplemental nurses. Check out the Immersion Program details and more in the Staffing World 2012 Advance Program. 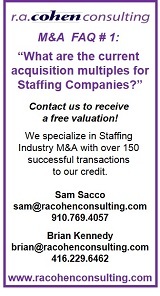 Register for Staffing World by Sept. 7 for the best rate available.